Do your lips blend into the rest of your face? Are you disappointed by their appearance? Are you wanting to diminish the lines in and around your lips? Lip augmentation is becoming increasingly popular with all the diverse ways we can tweak your lips to give you look you want. A pouty lip has become a hallmark of sensuality and sexiness, leading more and more women to attempt to imitate that look. Dr. Conrad offers different techniques for lip augmentation out of his Wichita, Kansas office. The technique used is determined by whether the patient wants fuller lips or their border back and lines softened. Lip augmentation is an effective way to plump your lips and give you the pout you desire. Dermal fillers, like Restylane® and JUVÉDERM®, are non-surgical procedures that are performed in the office. You are a strong candidate if you’re in good health. Dr. Conrad’s certified RNs will consult with you and make a recommendation on which method is the most appropriate to meet your expectations and treatment goals. 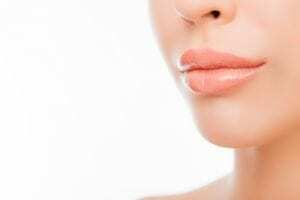 On the day of your procedure, one of Dr. Conrad’s three trained and certified nurses will inject a dermal filler made of hyaluronic acid into your lips. Hyaluronic acid is naturally occurring in your body and aids in the health of your skin. The procedure will only take a few moments, and you are free to resume your daily activities immediately following your visit. After a dermal filler injection, your results will be almost immediate. However, you will likely experience some swelling for a couple of days, so your full results may not be completely obvious for several days. Both Restylane® and JUVÉDERM® will usually last eight to 12 months. Adding volume to your lips is a quick and minimally invasive way to dramatically change the appearance of your face. To find out how lip augmentation can benefit you, contact our office to set up a consultation with Dr. Conrad at 316-681-2227.